As PM Jacinda Ardern returns from a triumphant tour to Britain and the capitals of Europe, her officials have probably begun to assess what the more substantive gains from the trip might have been. Most of the chatter has been about potential trade deals – so lets just assume for the moment that bilateral trade deals between big and small countries are a good thing, despite the perils they pose to the smaller party. Currently, Britain is so involved with its Brexit nightmare that there seems little prospect of any substantive early progress on an FTA with Britain. In any case, New Zealand should be wary of being the first cab off that particular rank. Why so? Because a weakened, post-Brexit Britain is going to be forced to swallow some stiff medicine in its future FTAs with the US and Australia. Arguably, we shouldn’t be volunteering to be the first post-Brexit deal, given that Britain will be seeking terms from us that will inflate its bargaining position in its subsequent negotiations with those bigger trading partners. Arguably, we should stand back and let the Americans and Aussies draw first blood. At the very least, we need to be playing harder to get. Furthering a trade deal with the European Union looks to be a far more promising medium-term gain from the Ardern trip. In late May, New Zealand will be looking for a green light from Europe, in order to commence negotiations. 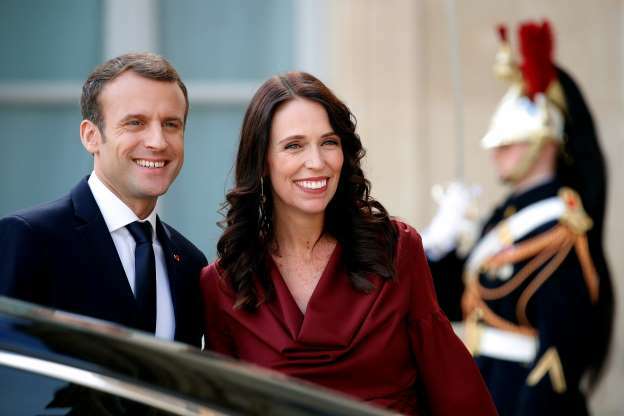 Ardern’s Elysee Palace meeting with French President Emmanuel Macron may have been the most significant stop on her entire trip. Ardern and Macron share a lot in common, starting with climate change policy. Macron and Ardern are essentially Third Way politicians, in that they both rely on markets to deliver the means to tackle social problems. In December, France imposed a ban all future oil and gas exploration, with a total phase-out of existing fossil fuel contracts envisaged by 2040. New Zealand has announced the same phase-out, but more conservatively, by 2050. Agriculture has always been the main stumbling block preventing New Zealand from gaining better market access to Europe for our exports. Traditionally – from Charles de Gaulle to Jacques Chirac – France has been the most staunch defender of the Common Agriculture Policy. For decades, the CAP has thrown a lifeline to small and medium scale European farmers by supporting their incomes – and a way of life that’s widely seen to be an essential part of the social fabric, and vital to the economies of some regions. In his impassioned Sorbonne speech on closer European integration in September, Macron said it was high time to review “without taboos” whether the Common Agricultural Policy was still fit for purpose, saying he was not convinced it was. While touching the CAP was a long-standing French taboo, farmers found the system horribly bureaucratic and unsatisfactory, he said. Agriculture is a shrinking part of the economy. While France remains Europe’s biggest food producer and exporter, farming and fisheries now account for less than 1.5 percent of GDP and 2.7 percent of employment. Even adding the wider food industry, the sector generates just 3.6 percent of national output and around 5 percent of jobs — down from 6 percent of GDP and 11.9 percent of employment in 1980. Furthermore, Paris is no longer a net beneficiary of the CAP since it pays in more than its farmers get back, according to European Commission data. It is a situation that calls for a delicate balancing act. Already Macron is seen by many of his critics to be little more than a rebooted Blairite who is too much in thrall to the global financial elites, and insensitive to the social decay and pain in France’s rural hinterland. Change is afoot though, regardless. In February, Macron gave a speech urging French farmers to invest more in their future, and not to blame all of their problems on foreign competition. France’s centrist president has promised 5 billion euros ($6.2 billion) in agricultural investment as well as minimum farm prices to prevent producers selling at a loss. But farmers and their FNSEA lobby group remain concerned about issues ranging from trade talks with the South American Mercosur bloc to a land-buying spree by Chinese investors….The budget for the EU’s Common Agricultural Policy should not be cut by more than Britain’s contribution as it exits the 28-member bloc, he also said. Clearly, Macron wants to reform French agriculture – and it could become politically useful for him to be able to blame at least some of this necessity for transition on EU-wide trade initiatives, such as an FTA with New Zealand. Overall, what I’m suggesting is that if we wish to promote an FTA with the European Union, then France – instead of being an automatic obstacle – could become a key ally. Ardern’s evident rapport with Macron on climate change policy (and on agriculture’s role within it) will help our efforts to secure greater farm trade access to the EU. By year’s end at least, the Ardern government will be looking for a visit by EU Trade Commissioner Cecilia Malmstrom. Late last week, Malmstrom completed an FTA between the EU and Mexico, to sit beside her successful efforts on prior FTAs with Vietnam and Japan. She is the key player on the EU side, and – interestingly – she is also the main European opponent of the current international system of investor-state dispute tribunals. Footnote: For a coherent mainstream account of Emmanuel Macron’s aims, this Brookings Institute essay depicts France as a rebooted and agile ‘start-up’ power. In the current global context, France’s situation is favourable for lack of contestants among Western democracies. Domestic politics prevents both the United Kingdom and Germany from playing a leadership role in Europe, leaving the field to France. Trump’s America is all too happy to pass the torch. The reaction to Lorde’s issues over her decision not to perform in Israel pales in comparison to the firestorm of fury that has erupted over Natalie Portman’s refusal to accept the $US1 million Genesis Prize aka “the Jewish Nobel” if Israeli PM Benjamin Netanyahu was to be present at the award ceremony. Her problem? The treatment of Palestinians in Gaza, up to and including the recent shootings of Gaza protesters. Portman’s own Instagrammed explanation (which refers to Gaza only by implication) can be found here. As her explanation makes clear, Portman (who holds joint US and Israeli citizenship) has been vocal in opposing the BDS economic boycott of Israel. Yet that stance has been eclipsed by the furore over the prize-giving snub – which has triggered calls for Portman to be stripped of her Israeli citizenship, claims that she is borderline anti-Semitic, accusations that she had previously dodged service in the Israeli military and suggestions that her action is comparable to Annakin Skywalker going over to the dark side. On another plane entirely – but also music that’s grounded in its sense of place, within the San Francisco Bay Area – Deafheaven have issued their first single in three years. Last week, the 12 minute “Honeycomb” provided the first taste of their new album Ordinary Corrupt Human Love. Since their 2012 album Sunbather, Deafheaven have been typecast as the black metal band for people who normally don’t like black metal. The new single offers the same maelstrom of noise, punctuated by typical bursts of lucid, languid beauty from guitarist Kerry McCoy… and those shoegazey elements kick in around the 7 minute mark on this track. George Clarke’s vocals aren’t easy to decipher, but his concerns don’t appear to be quite as dark here as they were on most of Sunbather. Nice video of the Bay Area sights too.